Did you know that spending time in nature is said to alleviate stress and support positive mental health? Join TELL and Outdoor Japan for a hike in the beautiful Hanno, Saitama hills on October 17, 2018. 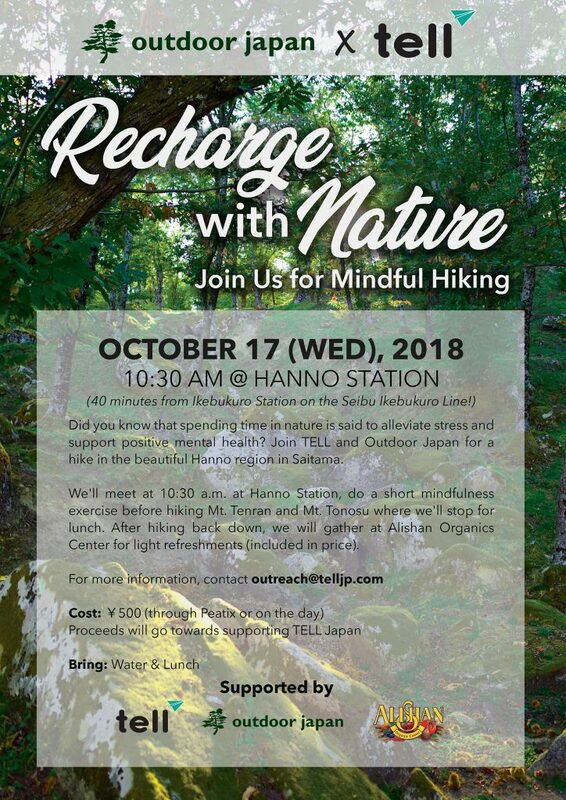 We’ll meet at 10:30 a.m. at Hanno Station, then do a short mindfulness exercise before hiking Mt. Tenran and Mt. Tonosu, where we’ll stop for lunch. After hiking back down, we will gather at Alishan Organic Center for light refreshments (included in price). Don’t forget to bring water and lunch. All proceeds to TELL to support suicide prevention and mental health in Japan.